The City is working with citizens to develop a Streetscape Master Plan for 17 Ave SW between Crowchild Tr. & 37 St. S.W., as part of the Main Streets design phase. 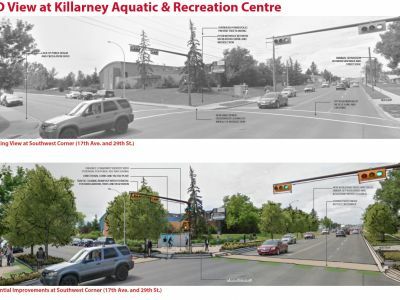 Based on community input obtained through consultation, stakeholder and public engagement, the principles below have guided the streetscape design for 17th Avenue SW.
• Significantly increase the number of street trees, tree canopy and overall vegetation along the Main Street to create a more inviting streetscape for the community. • Introduce sustainability elements that contribute to a healthy environment considering planting/rain gardens for storm water infiltration. 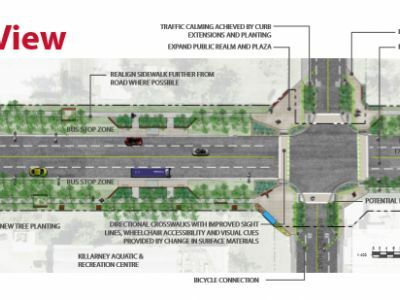 • Introduce safer and more accessible pedestrian crossings and multi-use paths that provide more connectivity options for cyclist and pedestrians, with generous setbacks to allow soft landscaping and snow storage locations where feasible. 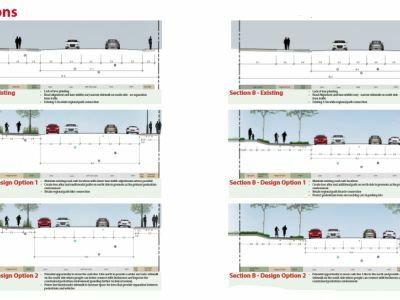 • Protect pedestrian areas by emphasizing design elements as an opportunity to create a consistent and uniform design along the entire corridor. • Provide enhanced pedestrian lighting at major nodes and plaza’s. • Focus on public realm enhancements to maximize programming where there is generous setbacks at major nodes, seek opportunities for landscaping, pop up parks and parkettes seating and public art. 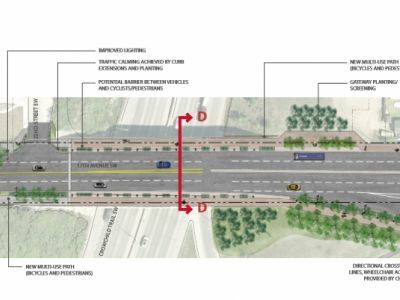 • Create a sense of entry/gateway at main corridor intersections, such as 37th Street SW and Crowchild Trail. • Maintain existing traffic flow and convenient transit service along the corridor. • Introduce traffic calming measures on residential “feeder” streets with extended curbs and bump outs. • Create a consistent design language for bus stops – improved paving and accessibility for bus shelters and major intersections. • Review opportunities for on-street parking as a means of traffic calming, increasing pedestrian comfort, and assisting business. Do the Project Vision & Principles support What We Heard from the Community in previous engagements? Based on what we heard from the community, combined with our design analysis, the Project Principles were used to further develop six key objectives in three focus areas. 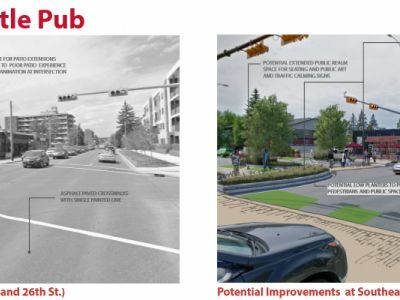 These objectives will be used to evaluate options and guide implementation of the 17th Ave SW Streetscape Master Plan. Maximize under-utilized right of way to move pedestrians away from road. No lane reductions or road diet will maintain high volume traffic flow. 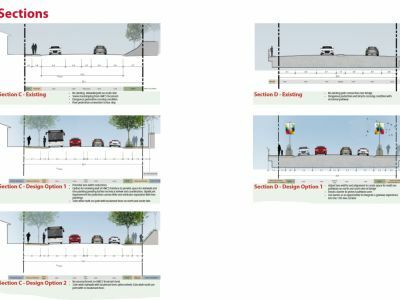 Provide better separation between vehicles and pedestrians on south side. Create multi-modal promenade with more trees and wider boulevard. Traffic calming on residential street entries provides potential for rain gardens, space for seating, improved lighting and landscape features/public art. Bumpouts shorten crossing distances and increases safety for pedestrians by improving sight lines and providing directional wheel chair ramps. Work with private landowners in order to improve interface with public realm and consolidate/reduce driveways where possible to create a safer pedestrian environment. Improve lighting for safety and comfort with pedestrian scale light fixtures. Social and economic benefits include increased property values, health benefits shade, human scale and vibrancy. Street tree are functional and promote a healthy environment providing oxygen, shade, habitat for birds and rain water absorption. Street trees improve character and Identity by providing a sense of gateway and definition to the street edge. Maximize public land right of way to create a safer pedestrian oriented environment with wider boulevards, sidewalks and increased tree canopy. Improve Recreation Centre interface by increasing public plaza and circulation space for bicycles and pedestrians at crossings as well as opportunity for additional seating with proximity to bus shelter. Create public realm flex zones at major intersections with signage, public art, wayfinding or outdoor fitness opportunities that correspond to the healthy living theme of the Recreation Centre. Coordinate interface with private land owners and improve pedestrian connectivity to building frontages. Seek opportunities for stormwater infiltration, rain gardens and tree planting opportunities at residential street bump-outs. This provides traffic calming and sustainable landscapes for adjacent neighbourhoods. Economic and Social benefits include the promotion of healthy living activity and better connectivity to private businesses. Trees and wider boulevards provide separation from traffic. Better Function and Mobility is created by increasing circulation space at key nodes providing more circulation space for bicycles and pedestrians. Potential rain gardens provide environmental benefits by filtering stormwater run-off and reduce silt deposits into the existing storm water system. Rain Gardens are functional components for City stormwater infrastructure. Character and Identity has been reinforced with consistent use of high quality materials and landscape features with potential for theming along the entire corridor. 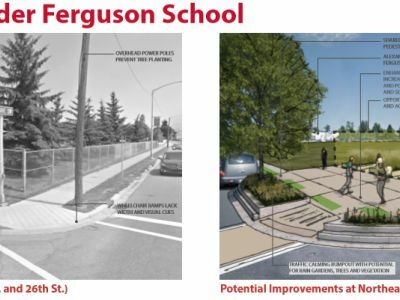 Improve pedestrian crossing and provide safe connectivity to the elementary school for children by providing directional textured crosswalks, better signage and clear delineation of space and connections for pedestrians, bicycles and vehicles. Opportunity to coordinate with school board and activate street interface with public use of amenities and improve safe connectivity to the school. Increase sidewalk widths at SW corner to improve restaurant experience. Create larger public realm flex zones for seating, public art and patio spillout. Add off-peak parking at business frontage. Economic and Social benefits include the provision of additional space at the corner for restaurant patio extensions or rest areas where people want to hang out. Accessibility is also increased for families, children and cyclists. Better Function and Mobility is created by curb extensions that create better sight lines, shorter crossing distances for pedestrians and reductions to traffic speeds at intersections. Enhanced crosswalks provide visual cues to slow vehicles and give priority to pedestrians. 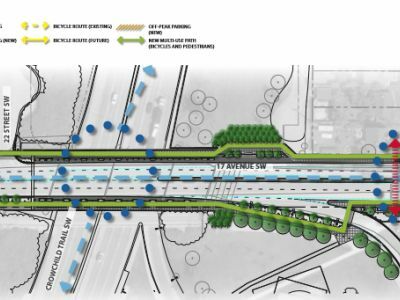 Economic and Social benefits include improved accessibility and healthy living/fitness opportunities for pedestrians, cyclists and all users of 17th Ave. Improved path connections will benefit local businesses at the east end of 17th Ave. Better Function and Mobility is created by adjusting lane widths and alignment in order to accommodate more public realm space and paths that provide a safe connection over the bridge. Vehicular traffic flow is maintained. Character and Identity can be improved by incorporating landscape features, pageantry or public art integrated into the functional bridge design elements such as the railings, lighting and protective barriers. Economic and Social benefits include establishing a sense of place and gateway into the 17th Ave corridor from the east. This increases property values and a higher profile and economic benefits for business owners. Better Function and Mobility is created by enhancing existing crosswalks to slow vehicles and give priority to pedestrians while crossing 17th Ave. The multi-use path connection over the bridge will encourage more visitors and residents to this east portion of 17th Ave. 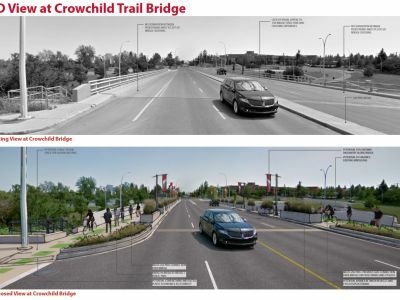 Better Function and Mobility is created by adjusting lane widths and alignment in order to accommodate more public realm space and paths that provide a safe connection over the bridge. Character and Identity has been improved by providing space for tree lined boulevards, amenities, on street parking and landscape features or public art that can be themed with consistent materials. Public input is now closed. Please click here to view the 'What we heard' report. Objective # 6 Use of high quality, consistent, and durable materials. Join us on Dec 3 from 5 - 8 p.m. at the Glamorgan Community Hall to provide your input on potential design options, ask questions and learn more. For updates subscribe to the Main Streets Program email list.